ScienceDaily (Mar. 11, 2011) — Preserving an intact population of weed-eating fish may be vital to saving the world’s coral reefs from being engulfed by weed as human and climate impacts grow. A new study by researchers at the ARC Centre of Excellence for Coral Reef Studies has found weed-eaters like parrotfish and surgeonfish can only keep coral reefs clear of weed up to a point. After the weeds reach a certain density, they take over entirely and the coral is lost. For some years researchers have pinned their hopes on the ability of weed-eating fish to keep the weeds at bay while the corals recover following a major setback like bleaching, a dump of sediment from the land, or a violent cyclone. However the latest work by Dr Andrew Hoey and Professor David Bellwood at CoECRS and James Cook University shows that once the weeds reach a certain density, the fish no longer control them, and prefer to graze less weedy areas. 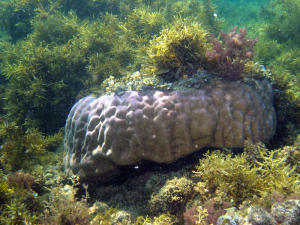 “As a result, the whole system tips from being coral-dominated to weed-dominated,” Andrew says. Coral reefs are in decline worldwide, with many of them — especially in the Asia-Pacific region — showing ‘phase shifts’ from being coral-dominated to degraded states dominated by large fleshy seaweeds. The new insight into how well or poorly fish control weeds was gained by transplanting different densities of sargassum weed on a reef off Orpheus Island — and then using remote video cameras to record what the fish did. “My wife and I must have watched hours and hours of video of fish feeding on weeds and counting the number of bites they took. It’s one of the less glamorous aspects of doing marine science,” he admits with a laugh. In all they counted 28 species of fish taking 70,685 separate bites of weed and removing an average of 10 kilos of weed a day. In the more open areas this was enough to control the weed. But Andrew also noticed the fish avoided the densely-weeded areas, perhaps for fear of predators lurking in the weed or because mature weeds are less palatable. Fortunately, in Australia’s Great Barrier Reef Marine Park the harvesting of herbivorous fish is limited to a few recreational fishers. However Andy says it is his view that herbivorous fish ought to be carefully protected in order to give the Reef’s corals their best chance of making a rapid recovery from impacts like mass bleaching, the mud dumped by recent floods, and cyclones like Yasi. “We should also bear in mind that this study was conducted in an area of the Great Barrier Reef Marine Park that has been protected from all commercial and recreational fishing for over 20 years and so is likely to have intact fish communities. The paper appears in the latest issue of Ecology Letters.